My mother didn’t die when so many others did – and so lived to give birth to me. I write about this now, because it has everything to do with today, even though the cataclysm in which so many perished happened more than 75 years ago. I owe my life, in part, to people who were willing to risk theirs, whose names I will never know. The story is etched in my bones. I remember its telling and retelling as far back as my early childhood memories. The details are blurred with the passing of time. No one who lived it is still alive. I would not know how to verify the specific facts. So I write this story to the best of my memory, knowing its truth in the deepest and widest sense. My mother’s family were Dutch Jews with a several century history of calling Holland their home. They were Sephardic Jews, descendants of those who fled the Spanish Inquisition in the 1500s. They came from a people who had a well-refined intuition about when it was time to flee and had found the ways to do so. More Jews from Holland died in the Holocaust than from any other Western European country. An often used estimate is 75%. (Other estimates range as high as 90%.) How did this part of my family manage to survive? And what might be the implications for our times of climate crisis, when we are already living in what is called “The Sixth Extinction” (with dozens of species going extinct every day), when the future of life as we know it may hang in the balance? My mother’s family considered themselves Dutch first, as did many Dutch Jews. They were only nominally religious, yet proud of their history as Sephardic Jews. My Grandfather was a professional classical musician. He played woodwinds (bassoon, oboe, clarinet) with the Dutch symphony. My grandmother was a visual artist. She was born and raised in Amsterdam, where most of Holland’s Jews lived, in a vibrant neighborhood with a historic theater a half block from her home and the Amsterdam zoo only a block away. During World War 1, my grandmother’s parents (my great-grandparents) took in a German Jewish orphan called “Ulie”. She was raised as my grandmother’s little sister. When Ulie grew up she returned to Germany. Over time the family stopped hearing from her. My grandmother married and moved to The Hague, about an hour from Amsterdam by train. My mother and uncle were born there. The family watched nervously the rise of Nazism in Germany, which shares a border with Holland. One day, as my grandfather told the story, he was returning home from rehearsal when he was approached by a stranger who said he was a friend of Ulie. The stranger then began a conversation about Ulie. Eventually the stranger asked if my grandfather would do a big favor for Ulie, even if it was dangerous. My grandfather replied that Ulie was like a sister to his wife and he would do anything for her. The stranger then revealed that Ulie, her husband and baby were being smuggled out of Germany and needed a safe place to stay while arrangements were made to get them to England. My grandfather invited them to stay with his family. These surprise guests changed how my grandparents saw the scope of the danger from Germany and this proved to be the salvation of my family. Most of Europe was unaware of all that was going on in Germany, and mass extermination plans already being laid for the near future. How could they know? Many Jews in neighboring countries believed, not unreasonably, that the safest course of action was to hold tight. Many Jews in Germany believed the best way to survive was to keep a low profile and obey the increasingly onerous laws that restricted and marginalized Jews. Many Jews (including Anne Frank’s family, who immigrated from Germany) believed Holland would be safe, in part due to its neutrality during World War I and its long tradition of religious tolerance. The situation was far more complex and unclear than hindsight may lead us to believe. Many Jews did try to emigrate, but this was not easy to do. Most of the world’s countries had strict immigration quotas with complex requirements and long waiting periods. Each applicant competed with thousands of other equally desperate people for too few available openings. Most countries, including the United States, Canada and Great Britain, were unwilling to increase their immigrant quotas, even with this urgent need. There was always an air of clandestineness in the way my grandparents told this story, things they remained silent about, details they carried to their graves, that I wish I knew. It seemed that there was some kind of illegality about their harboring German Jews (who would not have proper immigration papers) and how they were to be brought into England. The impression I was given was that there was risk involved for my family. I remember my mother telling me that she was given strict orders not to tell anyone about Ulie and her family. These guests stayed in a room without windows, in the center of the house. My grandparent’s willingness to take this risk for Ulie and her family gave them connections to what seemed to be an early resistance movement. It also gave them insider knowledge into just how bad things were for Jews in Germany, and how bad they would be if Germany invaded Holland. As early as 1933, shortly after Hitler came to power, the first concentration camps were established. Initially they were to imprison “enemies of the state” (socialists, communists, homosexuals and others). Mass arrests of Jews did not begin in earnest until 1938. It seems that Ulie and her family were taken in an early raid and somehow escaped, in the process becoming connected with the people who helped her and her family arrive in Holland en route to England (again, likely an early resistance movement). They were in really bad shape when they arrived in my grandparent’s home. My grandmother’s parents, (who raised Ulie as a child) did not escape. They were murdered in Hitler’s death camps, along with most of my extended family. Yet, had my great-grandparents not opened their home to this orphan child, my grandparents would not have had an early warning of the necessity to leave, nor the connections to help them do so – and I would not have been born. We truly cannot envision the ripple effects of our actions and the impact they can have on the future. “Because we risked ourselves for others, we ourselves were saved,” I remember my grandmother telling me, over and over again, when I was still in elementary school. This message shaped who I am and how I have lived my life. I tell this story, which is so much a part of me, because of what it has taught me about life and about where humanity stands today. I write to share what I learned, and also to invite you to share what you may learn. It feels risky and vulnerable to share such a personal story so publicly. If I did not feel it was so relevant to our world today, I might not share it in this way. What does all this have to do with the challenging, perilous and complex times in which we live? Of course, nothing repeats itself exactly, and things usually turn out somewhat differently that we expect. Yet, we humans seem to look to the way things have been to set a rudder for what we might expect in the future. This tendency can make us resistant to the possibility of rapid and dramatic change. Yet it can also help us learn from times of rapid and dramatic change that came before. What can this personal story from the past tell us about the times we live in today? First: Have the courage to consider the worst possible outcome, even though it is not certain that things will turn out this way. For my grandparents, this meant considering that Germany would invade Holland, even though many people did not believe this would happen. It also meant considering the possibility that the Nazi’s were doing something much worse than sending Jews to Labor Camps (which is what people were told – and was certainly bad enough). For us today it means considering the worst possible scenarios for climate catastrophe, and for what our government may be up to. The future course of the climate crisis we are facing (along with the interconnected crisis of our civilization) may not be precisely or fully knowable. Yet, given the enormity of the stakes and what we already do know, what happens if we consider a worst-case-scenario as a starting point in determining what is most important for us to become and do. We are living within an emergent fascism! This is what is taking place right now! What are we already seeing today? Erosion of civil rights, elimination of privacy protections, militarization of our police forces, increased repression of people of color, rising xenophobia, anti-immigrant sentiment, Islamophobia…. the list goes on. How might things look and feel to people in one of the groups being targeted? How might we know when things go from bad to a new level of beyond worse? How will people of European ancestry know what’s truly happening with marginalized groups? What preparations should we be making now? How might climate crisis and emergent fascism be interconnected? Second: Even though it may not be possible to alter the mega-picture of the storm gathering on the horizon, make your best guess about what might happen, what is most necessary to survive, and how much can be saved. Then find your part and get to work! ~ Get out those you can get out (what happened for my family). ~ Hide and care for those you can’t get out. ~ Resist and slow down the pace of destruction. Support life any way you can. (For the Resistance in World War II Europe, this included armed resistance, which I am specifically not advocating in this article). My grandparents’ early connection with a group that helped Jews get out of Europe made it possible for my family to escape – and me to be born. I owe my life to foresighted and brave people, whose names I will never know, who were willing to risk their lives (and may have done so) to save others. When people say, “there’s nothing you can do” about any of the multiple, intertwined crises we are facing today, I often respond that the fact I am alive refutes this assertion – then I tell a two-sentence version of my family’s story. Small (or not so small) things really do make a difference, often in surprising ways. Recommended article: Are We Living In A Police State? If Someone Broke Into Your House Are You Just Going To Sit There If You Have The Means To Protect Your Family? Fortunately, a lot of people are already trying to find the best ways to respond, and a lot of forms have already been created. Different people will have different opinions on what is best, and where is the right place for their passion, abilities and energy. How effective any of these diverse things are is yet to be seen. If what is already being done does not seem to be enough (in one sense, as with the Holocaust, nothing would be enough) then what else can be done that is not yet being done? Be relentless in looking at what seems most valuable to do. If one thing seems ineffective to you, it doesn’t mean everything is ineffective. Join in with something that is already being done that feels meaningful for you – or create something new. Can we get people through the coming cataclysm? What about polar bears? If not larger mammals what about cats? Rats? Hummingbirds? We live in a time that is being called “The Sixth Extinction”. Any species we can save is precious. Ultimately, some future person or being, animal or tree, may owe their life to your actions, even though they may never know of your existence or your name (as I do not know the names of all those who risked their lives so I could be born). To my understanding, habitable planets are rare in our universe, and the evolution of complex life and ecosystems is even more rare. This phase of evolution on our planet is precious. How much can we save for the future? Third: Recognize that the depth and meaning of your life, your own soul purpose and spark of brilliance is intertwined with the challenges and turmoil of our times. “The inner seeded story of the individual soul is secretly tied to the great drama of our world,” writes mythologist Michael Meade. The place where these two join together is where you will find the greatest meaning in your life. Crisis will shape you, change you, bring out things within that you never suspected were there. What you do (or turn away from doing) will shape you. Stretching to be your largest self will change you. Offering of yourself, to others, to the future, will widen your vision and horizon – and deepen your life’s meaning. Be willing to step into, not turn away from, the crisis of our times. My grandparents, a musician and artist, were lovers of beauty. They were unlikely people to step into acts of questionable legality, then abandon their comfortable lives and multi-century history with their country for the uncertain life of “penniless refugees”. Good thing that they were willing to step into this uncomfortable place – for them, for my mother and for me. Offering to others, offering to the future, will widen your vision and horizon – and deepen your life’s meaning. Your life may grow and expand in surprising, meaningful, and beautiful ways. There is a great gift to self in offering yourself to others, to the future. My great-grand parents and grandparents’ willingness to stretch themselves to help others proved to be what saved their lives – both physically and, I believe, morally and spiritually. My grandmothers words to me as a child, “because we risked ourselves for others, we ourselves were saved” hold both literal and metaphorical truth. I grew up wondering about the people in Europe during World War II. Who were the people that turned away, who refused to look at the terrible things happening to others, sometimes literally right next door to them? And who were the people that did not turn away, who risked their lives for others? I wonder the same thing today, when I look at the potential for global climate catastrophe, knowing that, like everything else, it will be those who have the least who will feel the impact the most. I wonder that same thing when I see rising tides (in our country and Europe) of anti-immigrant hostility, xenophobia, and Islamophobia. We won’t all do the same thing in the same way, just as those who resisted the Nazis did not all do the same thing. The important thing for each of us is finding the right thing(s) to do – and doing it. It may just save your life – your spirit and soul life, and possibly your physical life as well. Perhaps it all comes down to what may be the one essential question of our times – How can we be worthy ancestors for our descendants (human and otherwise)? LOL! I have to laugh at Albert. Does not understand the OT and the NT and why Jesus had to die. Why a GOD had to die! Albert still stuck in human misery and suffering. He shall die like his ancestors did and all who reject the last offering. “Lessons from the ‘Holocaust’?” Really? Eisenhowers’s Rhine Meadows Death Camps? Or, maybe Morgentaler’s Clinics ? Henry Morgentaler was a Jew born in Poland. As a youth he was sent to Dachau. After the war he immigrated to Canada and went into medicine. He sued the Queen for abortion legalization (the Jews in USA did the same thing) and brought it about. He went on to open more than twenty abortion clinics and train more than 100 doctors in his invented vacuum aspiration method. Solely because of this 1 “holocaust survivor,” countless millions of innocent lives have been wasted. Dachau was no millstone around Morgentaler’s neck. Nor for anyone else who was fortunate enough not to contract typhus. The name of the ancient German town of Dachau comes from the Biblical Hebrew word “dachah” (Strong’s h1760) to cast down or cast out. 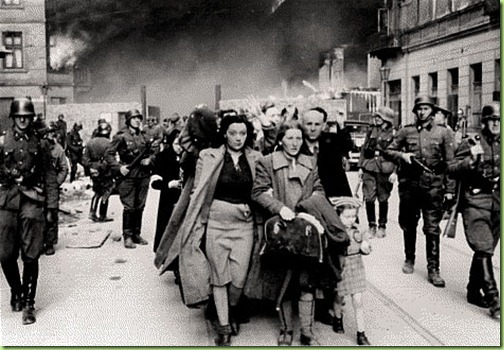 from the German people as “holocaust survivors” exceeded 5 million. Yet the best estimate of the TOTAL number of Jews in German occupied Europe was NOT more than 3.7 million. Einsteinian math. The world is waking up to the Truth of the greatest fraud the planet has ever seen. A Vietnam vet who actually fought, only 1 in 7 Americans in country actually fought. I got my sucking chest wound after 3 months and they still didn’t let me go home. I was a low level infantry platoon officer and saw amazing things about how government works, ours and theirs as I walked around through desperate villages in “free fire” Zones in Vietnam and even Laos in 1967-8, during the TET offensive. Free-fire zone meant anyone in those zones were OK to be killed. Think about that here under military law. If you don’t go to the FEMA camp when they say so you are subject to be dead in a free-fore zone. The police-state in the article above, they did it in Vietnam and they are now developing the same kind of police state here now in the United States. Be fear-full, they don’t give a damn about you or “migrant-insurgents” they are sending our way ultimately to fight us in religious and race wars. Yes the powers that be are the international gangster banksters. Always have been. As the WWI marine Corps General Smedley said, “War is a racket.” Too true. They want One World Government—Agenda 21, now agenda 2030 which are all about control of you. Good news is to wake-up to those historical facts. Once it is in your head clearly, you can fight in many small ways. Fight. Fight early and often any way you can. Always be a freedom fighter. Be independent of our hidden overseers. They see you are their taxpaying slave. Today, they are right. Please, wake-up. All the jewish fables in the world will not stop the germans from having a reich. You will see swastikas fly again in germany and there is nothing you can do about it. The Canaanites/Amorites/Philistines/Midianites/PALESTINIANS were in PALESTINE long before Israel was even thought of. The PALESTINIAN’s ancestors were there when ABRAHAM passed through from Babylon/Ur ……Israel’s “claim” to Palestine is based entirely on War Crimes and GENOCIDE. These passages are the foundation of Israel’s self written “deed” to the land of Palestine. If they are not ALL true, then the entire “claim” to Palestine, in the book THEY WROTE, IS NOT TRUE. Deuteronomy 3:18 and I commanded you at that time, saying, The Lord your God hath given you this land to possess it: ye shall pass over armed before your brethren the children of Israel, all that are meet for the war. Where are THEIR “holocaust” Memorials! He that bows before God can stand before anyone or anything. YOU CAN SAY,no one knew what was going on in NAZI GERMANY,but you would be wrong,MY UNCLE DAVID was special forces us army,HE was sent to germany in 1936,to see what was really happening,HE spoke german like he grewup there,HIS team scouted all the RAILROADS,BRIDGES,DAMS and other important sites FOR THE COMING WAR,AMERICA KNEW WE WOULD BE ENTERING WW2,they also knew what was going on in germany too,,THEY NEVER lifted a finger to help anyone WHY,well thats a good question,THE entire government was guilty of TREASON even then,the USA,Briton,france,and the VATICAN were ALL in bed with HITLER,and supported him with weapons money and all kinds of ILLEGAL AID,including poison to use on the death camp inmates,DON’T anyone think it was any other way,america IS COVERED WITH THE BLOOD OF MILLIONS,from WW2,and the HOLOCAUST thats coming will be a thousands times worst then the last one was,THE LORD SAYS GET CLOSE TO ME,the american people are YELLOW as a banana and will not fight,AMERICA will be wipped off the map,and NUKED INTO THE HISTORY BOOKS,all your ALPHA MALES are in prison,and you can’t win a WAR when the only men in the country are ALL in prison,you women have fun,CAUSE YOUR GOING INTO SLAVERY,in countries all over the world,get close to the LORD america IS ENDING,and will never raise again………. “I’ve checked out Churchill’s Second World War and the statement is quite correct – not a single mention of Nazi ‘gas chambers,’ a ‘genocide’ of the Jews, or of ’six million’ Jewish victims of the war. Eisenhower’s Crusade in Europe is a book of 559 pages; the six volumes of Churchill’s Second World War total 4,448 pages; and De Gaulle’s three-volume Mémoires de guerre is 2,054 pages. About 1.1 million people, around one million of whom were European Jews, died at the Auschwitz-Birkenau death camp between 1940 and 1945. In July 1990 the Auschwitz State Museum in Poland, along with Israel’s Yad Vashem Holocaust Center, reduced the estimated number of victims at Auschwitz from the four million figure engraved on the plaques down to just over 1 million. That is a reduction of almost 3 million. Yet the claimed 6 million figure, claimed to include the Auschwitz numbers, WAS NEVER REVISED downward. At that moment, any claims to knowing the numbers of victims are discredited. G-storm took the words out of my mouth, couldn’t have said it better. Don’t lump “islamophobia” into a list of nazi traits–it’s certainly not “fascist” for a people to regard its wannabe-destroyers with hostility! And it’s not “humane” to let the enemy into the gates–on the contrary, that is nothing more than national suicide. Time for patriot websites to shut down and families hunker down low key. America is trashed and patriot radio shows and websites are utterly useless at this time. Patriot groups for last sixty years, some who fought to get us out of the UN in the 60’s, have utterly failed; work was all in vain, useless. Voting is all for nothing, politician scum world wide are controlled by globalists. prepare and get house in order. Laura, you are a clueless idiot! If others had thought as you do back in the 1700’s, this country never would have been founded in the first place, because the original patriots would have hid in the woods, as soon as they saw how huge the British forces were. People with lazy, ignorant, defeatist attitudes like you, don’t deserve the freedom that others have paid the ultimate price for. Get off your @ss and fight for your rights, or just go vote for Hillary Clinton in November, then sit and wait for the jackboots to come take you to the concentration camp. You disgust me!! Grim: You idiot, voting is for suckers, I quit three decades ago, knowing globalist elite pull the strings; if you don’t care about getting house in order and staying low key with family, then fine. You cannot use civilian type weapons against DARPA weapons in 2016.. Many are hiding out or plan to as they have locations to go to. This isn’t 1776 or 1860 when everyone had the same weapons to fight. When things quiet down, then if we don’t have the military on our side, then it’s over..this is a quote from a well known patriot talkshow last week. We must have the military on our side. Do you get it moron? This is 2016. Sadly we now live in a world where over reaching governments will kill you if they want. There are way more methods than in Hitler s time and the technology to find you is there as well. It is too late and we need to enjoy what time we have left. Agree, mow joe, read above post. One above mine by Grim is stupid, he doesn’t understand modern warfare. we must have the military on our side that’s the facts. Thanks for a great lesson from history. I hope some of the people that follow orders (police, military) in their daily lives will reflect on how wrong a government can go. The nazi govt. lost their humanity and did terrible things while most people were following orders. I do not believe we are handling the refugee situation wisely. I would agree that we need to offer the persecuted Christians asylum in this country as they work through the process of gaining their citizenship. However, the rest of the refugees remain suspect in my book and their are at least five, if not seven, M.E. Muslim countries that are not taking any Muslim refugees although they have the wealth and resources to do so. Their refusal to take in the refugees tell me that this is an effort on the part of militant Islam to Islamicize Europe and the US and create that world caliphate they’re so focused on creating. Please do not even bring up the issue of M.E. refugees in the same breath as those Jews who were denied sanctuary in the US during WWII. For that, this country is being judged. Yes, of course, never advocate armed resistance. It’s something that might actually work.